Ever since January’s surprise trailer release, “Cloverfield” fans have been pining to know what, exactly, does “10 Cloverfield Lane” have to do with the original? The answer: basically nothing— but that’s not a criticism, just fact. After a car accident leaves her unconscious, Michelle (Mary Elizabeth Winstead) wakes up chained to a basement wall, sustained by an IV drip. Her caretaker, Howard (John Goodman), insists he found her and brought her to his underground apocalypse bunker in the wake of an invasion that’s left the outside world uninhabitable. The bunker’s only other resident, Emmet (John Gallagher Jr.), corroborates his story — until presupposed facts fail to add up. You don’t have to see the 2008 creature feature to enjoy this first surprise hit of 2016. Producer J.J. Abrams has described the film as a “blood relative” to “Cloverfield,” the found-footage staple, meaning it technically could exist in the same universe where the extraterrestrial invasion depicted in that film plays out from different perspectives — the first from New York and now the second from rural Louisiana. But the film’s tagline, “Monsters come in many forms,” is an apt warning against this expectation. In order to keep the film’s association a secret, the project worked under the titles “Valencia” and “The Cellar” until Bad Robot Productions released the film’s final title as recently as mid-January of this year. Despite its titular connection to “Cloverfield,” this new film is more of a mind-bending thriller than a full-on monster bash. The most notable difference: A steadier cinematic outing in the Louisiana marshlands replaces the urban shaky-cam obsession, which divided critics and audiences. The close quarters also makes for a very stagnant setting, but move the character-driven plot forward, much in the way that “Cloverfield’s” characters existed inside a camcorder frame. With nothing much else to do, the bunker residents get to know each other and how each ended up underground. Michelle is a runaway fiancee who Howard either kidnapped or saved — a subplot with as much intrigue as the world outside the bunker. She befriends Emmet, a local odd-job-working college dropout who weaseled his way into Howard’s safe house at the last second. The tense question of whether Michelle and Emmet are prisoners or survivors takes the characters and audience on a thrilling ride, where Howard’s questionable character overshadows the potential danger outside. Michelle and Emmet’s mysterious paths to the bunker lead back to Howard, the film’s central focus. He explains that a chemical attack from someone unknown — Russians, Koreans, possibly Martians — has contaminated the air outside. As a doomsday prepping ex-Navy conspiracy theorist, his stubborn insistence but lack of proof leaves Michelle plotting an escape. Howard presents an antisocial, explosively impatient creature. Doomsday preppers and kidnappers both have to account for multiple possibilities and situations to operate. This similarity makes Howard’s character so chillingly compelling, while also making Michelle’s quiet escape attempts even weightier under his watchful eye. Winstead (“Scott Pilgrim vs. the World”) and Gallagher Jr. (“The Newsroom”) are also noteworthy talents. Winstead is a well of survival instinct — think Sigourney Weaver’s Alien-dodging Ellen Ripley with a dash of MacGyver — mixed with curiosity and suspicion. Gallagher Jr. provides an easy southern smile and some innocent humanity to the otherwise tense dinner-table proceedings. 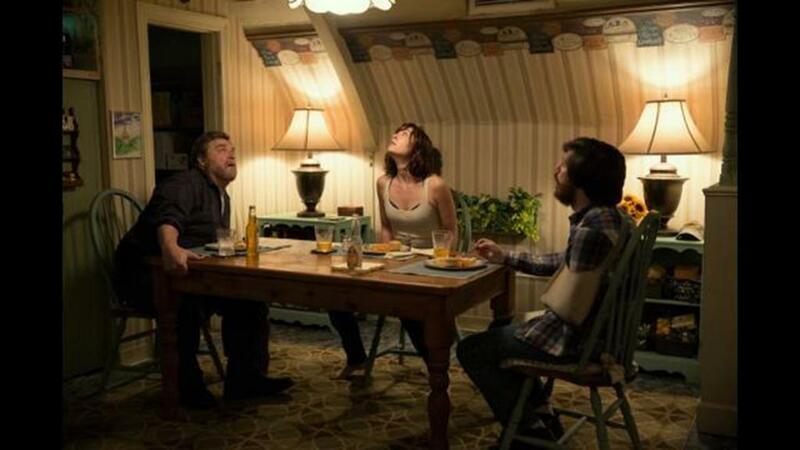 “10 Cloverfield Lane” is the impressive directorial debut of Dan Trachtenberg, whose only previous credit is a short film loosely based on the video game “Portal.” Trachtenberg creates a much-needed sense of space in the bunker, distinct in its coziness and claustrophobia by the end of the 103-minute runtime. At just over an hour and a half, the film’s wild ending teases more than it satisfies, offering scarce but crucial clues connecting its events in Louisiana to the ones in “Cloverfield’s” New York. Saying any more about the final act would be a disservice to the applause-worthy job Abrams and company did in veiling the film’s connection to “Cloverfield” thus far. What we can say is that it’s already drawn comparisons to “The Twilight Zone,” but could just as easily be classified as adjacent to “War of the Worlds” or “Falling Skies.” It’s unclear whether there will ever be any official closure to the lingering threads. “10 Cloverfield Lane” raises more questions about the “Cloververse” than it answers, but that doesn’t stop it from being a brilliant genre-bender of a film, and possibly the start of something great to come.